November 2, 2016 November 3, 2016 • Glenna G.
We spent a night camping in Idaho before driving into Kalispell, Montana. After grabbing a quick bite and catching up on world events and Facebook, we found a spot to camp on a Forest Service road. 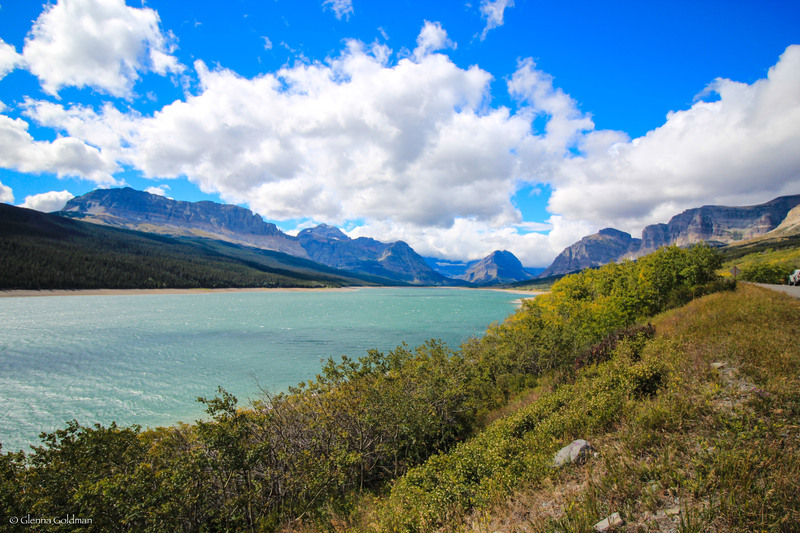 It had been a long drive, and we were eager to finally get to Glacier, touted as one of the most scenic national parks. The next morning we drove up Going-to-the-Sun Road, and I dropped Jake off at the Highline Trail. Unfortunately my ankle was still bothering me, so I drove around to the Many Glacier campground to try get a spot for the next few nights. The drive was winding and gorgeous, and I stopped at a few viewpoints to catch glimpses of glaciers and lakes. 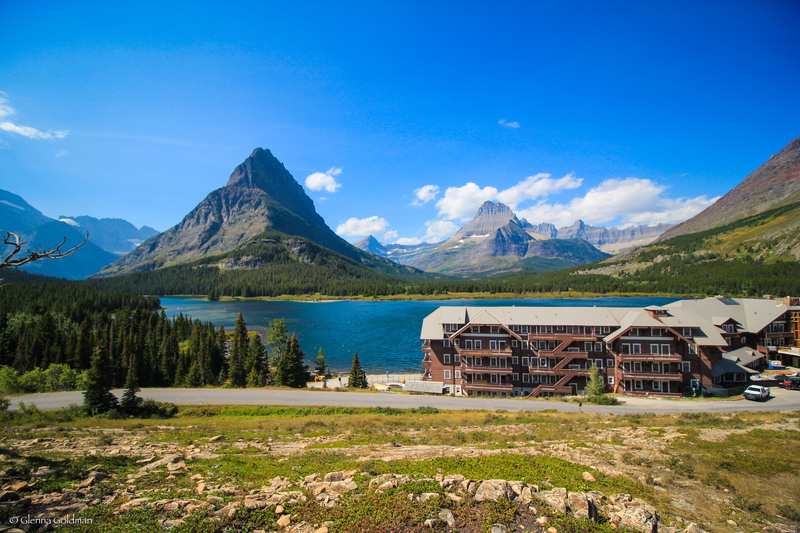 The Many Glacier Hotel was under renovation, but it was still a beautiful setting. I thought about doing a short hike around the lake, but many of the trails were under construction or closed due to bear activity. Jake had taken the bear spray, so I didn’t think it would be in my best interest to hike alone. There was a water ferry behind the hotel. There were also kayaks, which I might’ve considered renting if not for wind gusts so strong I found it hard to walk on the hill above the hotel. I relaxed and chatted with some fellow hikers until Jake returned. 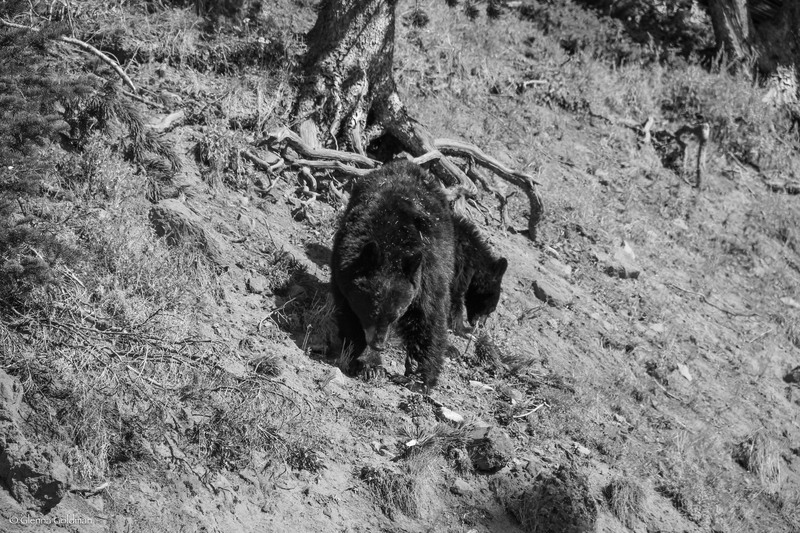 His photos were great, and he saw a grizzly and her cub! We had a nice little spot in the campground, which was almost entirely full. We attended a ranger talk about the geology of the park, and a bit about the glaciers. During the 20th century, there were 150 known glaciers in the park. By 2010, only 25 of these remained. It is predicted that all of the glaciers will be gone by 2030. Unfortunately, it rained for the next 2 days, and the most scenic trails on our list were closed due to bear activity. We attempted to hike around the lake to get a glimpse of Grinnell Glacier, but the glacier and surrounding mountains were encased in a layer of gray clouds. We checked the forecast, and with much disappointment, decided to head on to Yellowstone. Glacier was supposed to be the #1 park on our list to see this summer, but our near-perfect weather had come to an end. We drove on towards Yellowstone, stopping midway for a day of Wi-Fi and warm tea to get out of the rain. We drove a bit further, camping near the park’s northwestern border, and drove into the park early the next morning. Jake took me for a swim at the Boiling River, a few miles inside the park entrance. This place is not on the park maps, but there were quite a few people sitting in the river. It was quite a challenge to get the perfect mix of cold river and hot spring water, but we enjoyed it immensely. 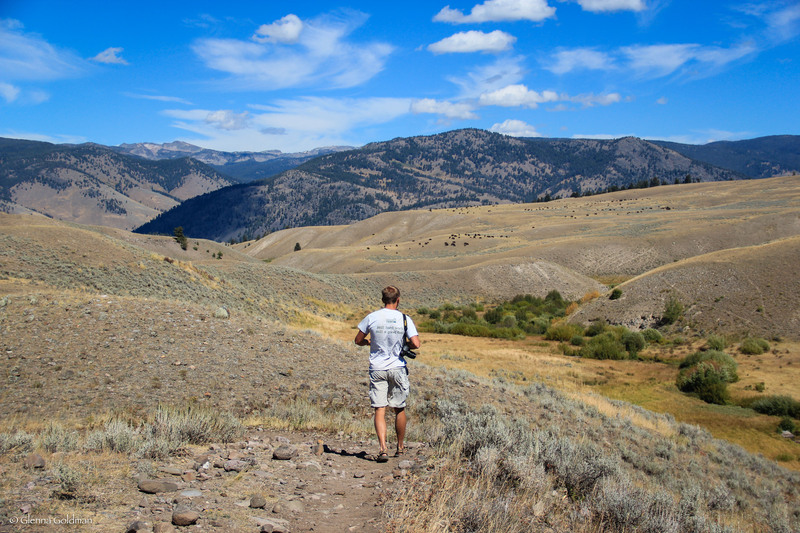 After changing into dry clothes, we explored the Mammoth Hot Springs area of the park. We walked along boardwalks, gazing at the otherworldly travertine formations and breathing the crisp, sulfur-scented air. Mammoth Springs had a nice visitor center, complete with elk grazing on the lush green grass outside! We watched a video of bison attacking people (perhaps they were trying to take a selfie) and checked out a display illustrating the underground workings of Mammoth Hot Springs vs Yellowstone’s Geyser Basins. 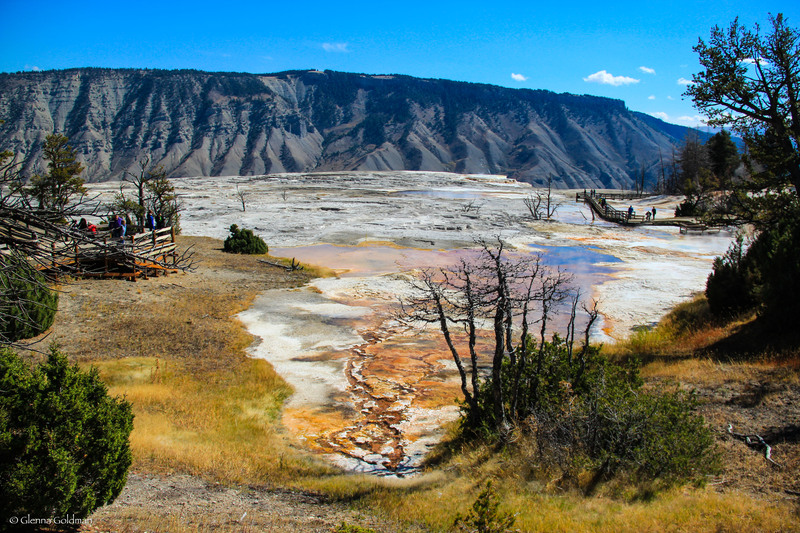 At Mammoth Hot Springs, hot water travels through buried limestone, remnants of an ancient sea. Travertine terraces form rapidly, and there are no geysers, just flowing water. At the Geyser Basins, the springs are under pressure, spouting out through vents made of rhyolite, which is hard rock from ancient lava flows. We took a drive along the Lamar Valley, reportedly the best spot to see wildlife in Yellowstone. We saw quite a few critters including pronghorn, osprey, and of course, bison. We took a quick hike to get a closer look at the bison. We encountered both bison and bear traffic jams along the road in Yellowstone. Some of the people were way too close for comfort… Don’t worry, I have a zoom lens! At dusk we pulled into a crowded parking lot to witness the best wildlife event of our trip. We watched as a male elk strode across a river, chased off a young buck, and proceeded to flirt with a herd of females. He bugled, which is quite an eerie sound. We watched for a while, transfixed, before realizing that we needed to find a spot to camp before dark. We attempted to find a spot in multiple campgrounds. For some reason the camp hosts here occasionally allow people to claim spots without paying, so there were a few empty sites that we really should have been allowed to camp in. There are also miles of forest service land just outside the park, but for reasons unknown they do not allow overnight camping there. Instead, we had to drive an hour outside of the park, back into Idaho. The next morning we explored the area around Old Faithful. The geyser was a bit underwhelming, but Grand Prismatic Spring was amazing. My only disappointment was that the overlook trail above the spring was closed due to maintenance. Yellowstone is a very cool park, and I can see why it’s one of the most popular in the U.S. However, it was extremely crowded. After so long in the wilderness, Jake and I were very annoyed by the crowds and traffic jams. I’d label this a must-see, but I would budget about 2 or 3 days to see the highlights of the park. At this point we were getting tired. We’d been on the road for 3 months, and living out of a Toyota Camry was taking its toll. 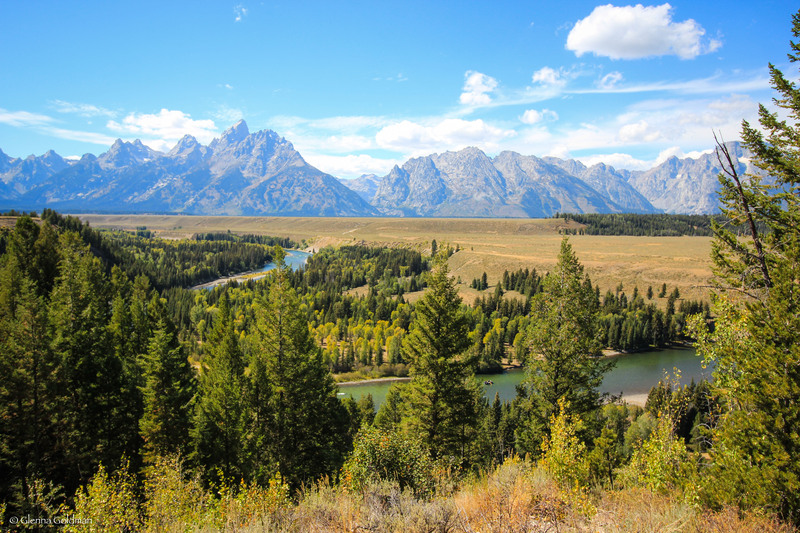 The weather was getting cold and my ankle was still bothering me, so we nixed our last planned backpack and decided to drive through the Tetons before heading to the last stop on our trip, Las Vegas. I’d love to return to the Grand Tetons, and we will likely be planning a trip there in the spring or summer. If you have any suggestions, please let me know! What a gorgeous park. The iconic mountains provided panoramic views the entire way. We stopped at the viewpoint below, and discovered that it was the location of one of Ansel Adam’s most famous shots. After saying hello to the horses, we drove and drove, before finally reaching our final stop, Las Vegas! Posted in Outdoors, Road Trip, Travel BlogTagged Nature, Road Trips, Travel, Travel BlogBookmark the permalink. You should backpack Teton Crest!! Wow amazing pictures!! Incredible post!! I have only really seen yellow stone on the tv but your pictures look fab! Thanks! I like your site, looks like you’ve been to some cool places. Excellent little guide! You have some amazing photos and I really enjoyed reading all about your travels. 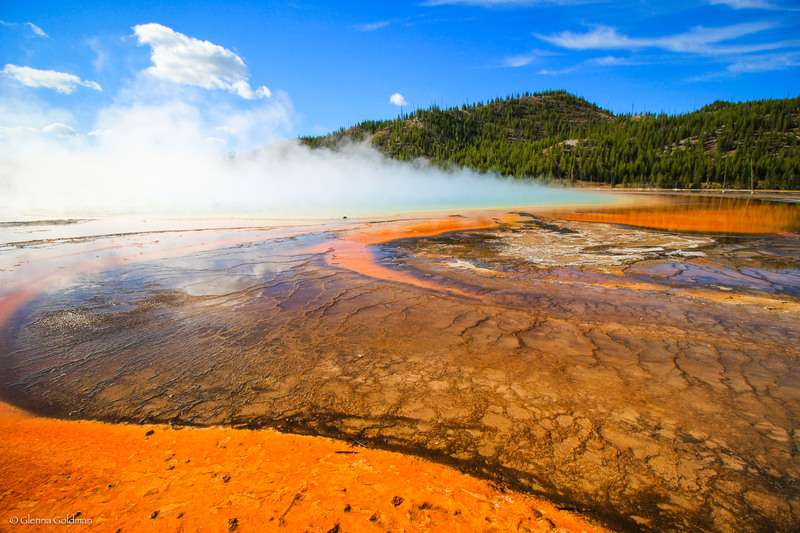 The geothermal activity in Yellowstone looks very interesting. Thank you, glad you enjoyed it! Yellowstone was unlike anywhere I’ve been before. Beautiful! We are going there this year. Can’t wait.